Jamie Vardy came off the bench to rescue a point for 10-man Leicester as they battled back to draw at Brighton. The forward was only deemed fit enough to be named as a substitute for the Foxes following a groin injury, but he fired home a second-half penalty to cancel out Glenn Murray's early header and secure a 1-1 draw. Leicester's hopes of taking anything away from the Amex Stadium took a hit when James Maddison was sent off inside the opening half-an-hour. 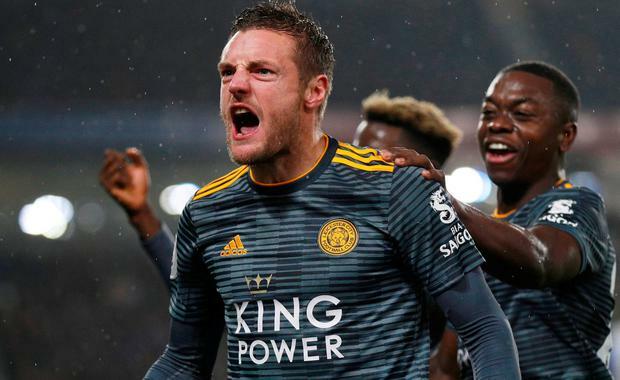 The midfielder was cautioned twice in two minutes, having overcome a knee problem to start for Claude Puel's side, who have now had four dismissals in the league this season. Murray's 15th-minute header was his seventh league goal of the campaign, bringing him level with the likes of Pierre-Emerick Aubameyang and Raheem Sterling, but the Seagulls created little as they failed to make their numerical advantage pay. Shinji Okazaki, in for Vardy, had an early penalty claimed turned away after he was challenged by Bernardo. That was the closest the Foxes got to the hosts' goal in the opening exchanges, with Beram Kayal forcing a smart stop out of Kasper Schmeichel at the other end. Brighton were deservedly ahead with 15 minutes on the clock as Murray headed home Anthony Knockaert's near-post corner to toast his 100th Premier League appearance. Leicester's hopes of getting back into the game suffered a blow when Maddison picked up two needless bookings in quick succession. The former Norwich man was shown his first yellow card for a petulant trip to stop Knockaert breaking into the Leicester half. The next caution came in the 28th minute as Maddison controlled the ball in the area before going down following a challenge from Shane Duffy, with referee Chris Kavanagh showing no hesitation in dismissing the midfielder for diving. Vardy was introduced 10 minutes after the interval and was immediately involved, catching Brighton goalkeeper Mat Ryan before he was on the receiving end of a Duffy challenge which saw the defender booked. With rain pouring down, the second half was largely bereft of both quality football and clear-cut chances, Jose Izquierdo firing wide for Brighton as they laboured in their attempts to wrap up the points. Leicester broke and were awarded a penalty as Kayal caught the feet of substitute Kelechi Iheanacho, with Vardy converting the spot-kick with aplomb. Iheanacho came closest to settling the contest but fired inches wide from Vardy's lay-off, while Kayal could not atone for his earlier mistake as he bent a last-minute effort wide.